Will you be treated right? When things go wrong–and even for every day needs like billing and showing proof of coverage–you want an insurance company that responds quickly and efficiently. An insurance agent can help you when the insurance company is slow to respond, but why not start out with the best? When it comes to customer service and satisfaction, I think that The Hartford Insurance Company is one of the best available. I’ve personally seen The Hartford respond time and time again, and they are unfailingly pleasant and eager to help. If you aren’t receiving the customer service that you’d like, and you are losing money because you are wasting time trying to fix insurance problems, call me and we’ll get you started with The Hartford immediately. Since most businesses are closed for extended periods over the holidays, and people are preoccupied with celebrations, businesses are especially vulnerable to theft over the Christmas weekend. Protect your business by taking precautions beforehand. Secure your lot. High-value cargo should be staged in an extra secure compound (for example, the compound should have a chain link fence of 9-gauge material at least 8 feet high and topped with barbed wire, properly anchored). Use a Security Patrol in your lot. Secure trailers while they are being staged. King Pin Locks and landing gear locks are recommended, with high security locks on the cargo doors. Close truck doors before pulling out into open view in the lot so that surveillance efforts cannot see what has been loaded on to departing trucks. Ensure your “Red Zone” is implemented. A minimum “Red Zone” of 200 to 250 miles. (The Red Zone area is the distance wherein the driver does not stop after pick-up). Encourage open internal communications and the reporting of any “out of norm” occurrences. Drivers should remain vigilant and maintain communication with their dispatch during extended stops at high risk areas such as truck stops and rest areas. Drivers and warehouse workers should not discuss any details regarding loads with anyone; specifically drop locations, routes, or contents. Consider a no-drop policy, keeping the trailer married to the tractor so that the tractor and trailer can be secured. For High Value / High Target Loads, consider using covert tracking devices which will enable geo-fencing during stops and tracking in the event of a theft. Employ theft prevention devices to disable fuel, hydraulic, and/or electrical systems. Shippers that utilize covert tracking systems should geo-fence and route fence staged loads. Consider installing a sensor to alarm the driver when the trailer door is breached. Instruct warehouse personnel never to divulge any proprietary codes, passwords or identification numbers to anyone, especially over the telephone. Send repeated communications regarding this policy and its enforcement. Warehouse workers and drivers should not discuss any details regarding the warehouse contents. Keep loading bay doors closed in order to prevent surveillance efforts from seeing what items might be on the loading docks. Consider implementing a procedure to authorize employees to question any unfamiliar person on the property. Review all physical security protocols as well as vendor/contractor access to the premises, particularly after normal business hours. Connect with the security system provider and confirm the conversation with them. Request a representative come to the facility to conduct any resets and/or have a pre-designated password with the alarm company that they can use to verify sharing of information. Review documentation and contracts in place with the contracted alarm company, paying particular attention to scheduled maintenance, system access and alarm response protocols. Obtain written confirmation from the alarm company that line security of all burglar alarms is in full service and will remain in service for the duration of the contract. Confirm that alarm monitoring personnel have accurate contact lists and phone numbers for employees responsible for reacting to intrusion alarm signals. It is important that everyone know their duty in the event of an emergency. Perform random security alarm tests each month. Update alarm call lists and require designated personnel to respond to ALL alarm calls, even if there is a suspected system malfunction. Never enter the building until police response has arrived. Travelers Insurance Company has an especially good Specialty Investigations Group to investigate and recover stolen shipments, and their Loss Control department actively help business owners prevent theft losses. How a personal insurance agent can help you recover from a personal or commercial loss. 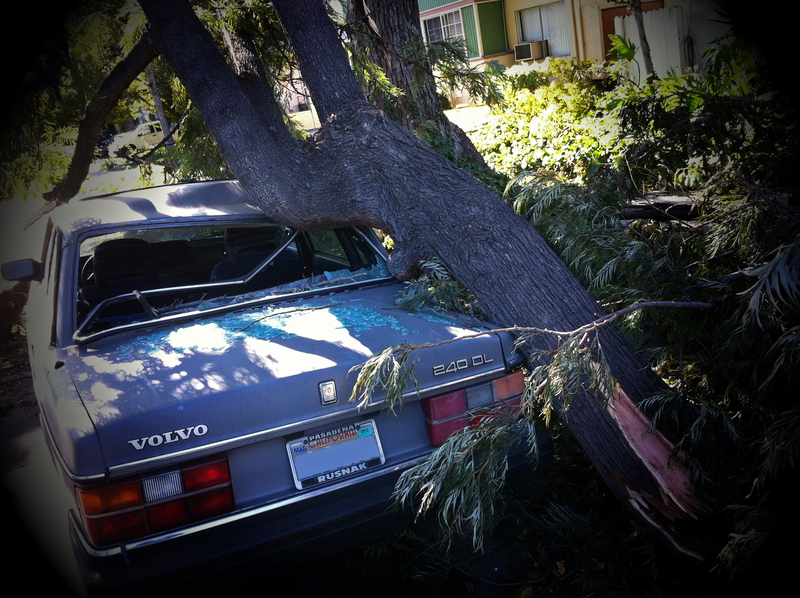 The fiercest winds in 50 years caused a lot of damage in Pasadena and Los Angeles on Wednesday. On the street where I live, I saw at least 2 cars that had been crushed by huge tree limbs that fell on them, smashing the roof and windows. “Comprehensive” auto insurance coverage, also known as “other-than-collision,” is devised to help an insured recover from just such a loss. It also provides coverage from theft. Home owners and business owners whose awnings blew away, or whose roofs were damaged, or windows broken, or who lost business due to a power outage, should be able to recover the loss from their property insurance. Businessowners’ policies even typically provide some coverage for plants, shrubs, and trees (usually limited to $2,500 or less per plant), and may be able to include the cost to replace the trees that were torn from the ground in their claim. The fastest and easiest way to report a claim is to call the insurance company claims hotline directly. My Safeco Insurance clients should call 800-332-3226. Insureds who have bypassed an agent by purchasing insurance online, or directly from the insurance company, must call their claims hotline, and have no other alternative. However, an insurance agent provides a second alternative to contacting the insurance company directly and dealing with the claims hotline. My clients know that they can always call me for assistance with the claim. Having an agent is valuable for (at least) two reasons: an agent has a personal, continual relationship with you and should be familiar with your special situation already. Less time is spent gathering information and correcting misunderstandings. Secondly, an agent is familiar with the “inside contacts” within an insurance company, and can help a client “go up the ladder” if a problem arises and the claim is not handled to the client’s satisfaction. For example, I recently assisted a business client who had experienced an costly auto accident. The dealership, where the Mercedes had been taken for repair, was backed up and not cooperating with the claims department. After several non-responses, and an estimate that was close to the car’s value, the insurance company moved to declare the vehicle a total loss, rather than proceeding with repair. The insured preferred to repair the vehicle. I intervened with both the dealership and the claims department, pointing out to the dealership that they were about to lose the repair business unless they offered better terms to the insurance company. On the claims side, I contacted the manager of the claims department, reviewed the valuation report, noted that the vehicle’s condition was better than the report indicated, and thus a total loss would require a larger settlement than previously thought. The vehicle was repaired, and my client was pleased. The insurance companies that I represent have excellent, fast, and friendly claim departments, and claims are handled to the customer’s satisfaction the first time around, which is why I recommend that clients make their initial report directly to the insurance company. But if the case goes awry, I’m available to assist. Pasadena will be green again, and the residents and businesses who are properly insured will be able to recover from their loss relatively painlessly. That’s what insurance–and an insurance agent–is for. In the admittedly boring world of insurance, it’s a challenge for companies to innovate and excite their customers with new products. When was the last time you saw a line out the door of your local insurance agent for the latest expanded coverage option? However, Safeco Insurance–which offers personal auto & homeowners insurance as part of the Liberty Mutual insurance group–has hit on a nifty new feature to help their customers. And as an added bonus, they get to be associated with trendy tech giant Apple, Inc. The new feature is Safeco’s iPhone application. 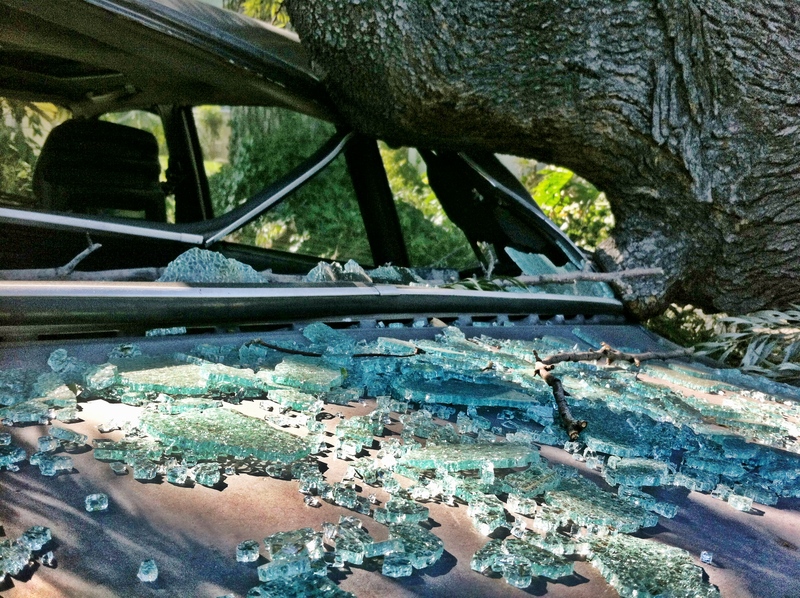 The app empowers customers to take camera-phone photos of their dented cars and wrecked roofs, and then e-submit to claims. It will dial directly to your insurance agent (me!) or the claims department, or call for Roadside Assistance. Plus, you can view your policy information, auto ID cards, or get a quote. BE STILL MY BEATING HEART!!! One of the app users recently sang its praises when she told us how it helped an unpleasant situation go more smoothly. A week after downloading the app, Texas agent Cherie Y was driving home on a dark stretch of rural highway, “in the middle of nowhere,” when she hit a deer. “It was a mess,” she says. Cherie immediately grabbed her iPhone and accessed Safeco’s app. “I pushed two options and I was reporting the entire claim after I had a three-way conversation with Roadside Assistance,” says Cherie. It was after midnight on a cold, wintry night so she was thankful when, one hour later, she found herself “warm and toasty” in the cab of a tow truck. The next morning, an adjuster stopped by and Cherie had her claim check in hand by noon, less than 12 hours after the accident. If you are a Safeco customer and have an iPhone, take a few minutes to download it. By the way, our office opens at 9am. See you in line! Cash has always been king in my family. At the store, my parents are always fumbling around with envelopes of dollar bills. My grandmother once carried around $30,000 of uncashed checks in her purse. She was afraid of banks. Me? I whip out the plastic at every opportunity. It’s hard to believe how fast and how drastically our world has changed in the last 20 years. When Reagan and Bush the First were president (remember them? ), we paid with actual currency, or we wrote a personal check. Nowadays, many stores don’t accept checks, and for many of us, cash is now for emergencies only. Our paychecks get automatically deposited in the bank. Bills are paid EFT. Groceries, gas, clothes, toys, and all the other junk we buy is paid for with credit or debit card. In the old days, when folks were walking around with cash, it was pretty easy to notice when you got robbed. Wham! A blow to the head, you’re shoved to the ground, and some thuggish type is running off with your purse or wallet. Or, you’re in a crowd, a stranger brushes by, and a few minutes later you realize that a pickpocket has deftly made off with your wallet. In our electronic age, however, theft can now easily go undetected. The only symptom of electronic theft is a difference in numbers displayed on a computer screen or printed on a bank or billing statement. Electronic theft and Identity Theft is now common. Just this December, the FBI caught a gang of thieves skimming from jimmied card readers at 99 Cent Stores in the San Fernando Valley. Over Christmas, a thief stole $62,000 from over 200 customers who swiped their cards at a gas station in Sierra Madre . The theft amounts were small, and many victims were unaware until they heard about it on the news. Skimming is the new pickpocketing; theft amounts are small and often go unnoticed. But, once the crooks have your card number and PIN, those small thefts can be repeated, adding up to a large loss over time. Identity Theft, on the other hand, is the new robbery. By getting a line of credit in your name, a crook can steal large amounts that’ll hit you over the head when the bill collectors start calling. There are a few common sense precautions to avoid Identity Theft: pay with credit, not debit; don’t respond to incoming emails or phone calls that fish for your info; ask for your free credit report on a quarterly basis. And, of course, there are credit monitoring services, which make a buck by tracking your credit record. The problem with credit monitoring services is that they actually make a LOT of bucks doing that. Offers that I’ve received seem awfully pricey to me, averaging $15-$30 per month. That adds up fast. However, one little-mentioned option is Identity Theft Protection that can endorsed onto your standard Homeowner’s or Renter’s Insurance Policy. Almost all insurance companies offer this protection as an add-on. And it’s cheap; typical cost is $12 to $20 in additional premium. Per Year. That’s more affordable than a credit monitoring service. The coverage and limit of Identity Theft Protection varies by insurance company. Usually, it’s limited to $25,000. If the theft involves a credit card, your liability is limited by law; the real damage will involve your credit score and your lost time. Identity Theft Protection may reimburse you for the time you spend trying to undo the damage. The time that a victim spends writing letters and making phone calls (imaging the time spent on hold and navigating automated phone systems!) to credit companies, in an effort to clear their record, can amount to thousands of dollars of lost wages, and lots of frustration. As part of the Identity Theft Protection, one of my insurance companies (Safeco) assigns a case manager to their insureds. The case manager can help you, so that you can avoid frustration and lost time in an effort to undo the damage and get your credit history cleared. Renters, who are often uninsured, can get Identity Theft Protection by purchasing a Renter’s Insurance Policy, and adding on the Identity Theft Protection coverage. Like Homeowners Insurance, a renter’s insurance policy covers loss to Personal Property (your “stuff”). Since the dwelling itself is not covered (the landlord is responsible for insuring his building), the cost of renter’s insurance is very affordable, usually $150-250 per year on average. In addition, most insurance companies will give renters a multi-policy discount on auto insurance, which could amount to real savings. If you are a renter, you can protect your possessions and mitigate your losses in the event of Identity Theft, and reduce your auto insurance premium by qualifying for a multi-policy discount. That’ll give you the confidence to keep swiping those credit & debit cards with style. Bill owns a dry cleaning and uniform rental business in Beaumont, Texas. Rita was born at sea, at the tail of an old frontal boundary, where convection and low-level circulation around an upper-level low developed from a little windstorm into a big windstorm. Rita is Hurricane Rita–a category 5 that hit in 2005. In our last exciting episode of Edewards.net, we suggested the need for business owners to have Business Continuity Plan, so that they can operate their business in the wake of a disaster. A business that can get back on its feet quickly can meet the desperate needs that suddenly arise, turning disaster into opportunity. This is the story of Bill & Rita, and how a Business Continuity Plan played out in real life. Originally, Hurricane Rita was not forecasted to come near Beaumont. In fact, it was supposed to hit down the coast about 150 miles. But, the weather pattern made a fast change and Hurricane Rita came charging straight through. The entire community evacuated, and Bill’s employee’s scattered across several states. Though Bill had a rudimentary emergency plan in place, it did not account for power loss or for the shortage of food and supplies after the hurricane. It took Bill a week to reopen his business. However, when he did reopen, he discovered there wasn’t much of a need for dry cleaning among his customers. There was, on the other hand, a huge need for a laundry service in the community. Local contractors needed clean clothes, so Bill’s company stepped up to fill this demand with a wash, dry, and fold service. Though many of his employees had made their way back to Beaumont and were ready to come back to work, schools had not reopened yet, so they needed a place where their children could be supervised. To solve this issue, Bill allowed his employees to bring their kids to work. Some of the kids pitched in and worked (perhaps not the best idea from a workers comp standpoint, but probably OK if the activity was very safe, such as folding laundry). Younger children played in a conference room that was converted into a kid-friendly area complete with video games and toys. “Though we had a basic emergency plan in place and were fortunate enough to reopen relatively quickly, we knew we could do a lot better,” said Bill. After Hurricane Rita, Bill immediately took additional steps to be better prepared for the future. As a result, Bill drafted a plan to board up and secure buildings prior to evacuation and created a more in-depth communication program that requires employees to contact their supervisors within 48-hours to let them know their location and a phone number where they can be reached. In addition, he stocked-piled supplies including bedding and linens, hygiene products, and enough food to feed 15 key employees for up to three and a half days. Those key employees, who are critical to getting the business back up-and-running, have been identified and notified, and Bill has worked with local authorities to get them clearance to return to the area early. Additionally, Bill has installed showers and a natural-gas generator. He also contacted his power provider to arrange for his utilities to be turned back on within 48-hours of an incident. This material is directly adapted from the federal government’s excellent disaster preparedness website, http://www.ready.gov, which provides sample BCM plans and a boatload of other useful information. Special thanks to Sonia at Golden Eagle Insurance who pointed it out to us. Thanks, Sonia! Does your business have an Earthquake Plan? The Big One hits. Power is out. Roads are blocked. Supplies are limited. How fast can your business get back on its feet? Can you be better prepared than your competitors? Could you gain new customers by being ready when other businesses are not? Here are some strategies for preparing for the earthquake, before it hits. Establish a Business Continuity Management Plan (BCM) that takes crisis management, and business recovery, into consideration. If a BCM is already in place, review and update it as needed for earthquake readiness. Consider where your employees live and discuss plans for continuing work. How will they get to work if routes are blocked? How will you communicate with them if cell phones & telephones & internet connections are down? Can you establish and agree upon predetermined procedures that can work around such complications? Brace all tall shelves and cabinets, tall machinery and equipment, or any top-heavy objects that could topple. Brace and support overhead-mounted fixtures, suspended ceilings, piping, heaters, and other overhead-mounted devices. Plan for continuous plant security. How will you protect your property from looters? Provide auxiliary equipment and energy supplies for critical services such as communications and lighting. Provide adequate support for mainframe computers. Back up your data at an off-site location. Provide flexible fuel supply connectors to avoid ruptured gas lines, etc. Bolt down and secure fuel-fired appliances, along with any pressurized gas cylinders. 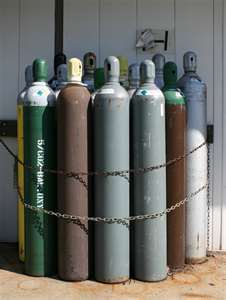 Will these gas cylinders break loose of their chains and roll? Provide isolation valves for piping systems. Provide alternate energy sources for vital equipment and services. Plan for customer and client awareness and communications. Provide an alert and warning system for all personnel on the premises. Designate a BCM Coordinator and a BCM Team. Assign responsibility to specific employees for advance arrangements to initiate the plan. Conduct a business impact analysis and risk assessment of the facility and its operations. Upgrade deficient areas. Upgrade the facility to current earthquake codes. Inspect tanks, stacks, signs, and chimneys for deterioration and bracing. Repair and strengthen as necessary. Identify and designate safe shelter areas in the structures. Identify and designate at least two evacuation routes for all areas. The geology off the coast of Japan is very different from the California coast, so an exact repeat isn’t likely. However, California is certainly an earthquake zone, and much of Southern California and Central California is vulnerable to flooding. The fact is: almost all property insurance excludes coverage for earthquake and flood. That means that your homeowners or businessowners insurance policy will not reimburse you if an earthquake or flood (including tsunami) causes damage to your home or business. And that exclusion extends to resultant damage, too. For example, if an earthquake causes your property’s gas lines to rupture, or causes an overload to your electrical system, which sparks a fire, the resulting damage–burned buildings and burned contents–will not be covered by insurance. The cause of loss in that example is earthquake. The earthquake caused the fire, and the fire caused the damage to property. Even though fire–by itself–is normally covered, the fire was caused by the earthquake, and therefore all the damage falls under the earthquake exclusion. Ditto for resultant damage from a flood. Earthquake insurance can be purchased as a separate insurance policy in addition to your homeowners or businessowners policy. Although earthquake insurance is very expensive (expect to pay about as much as your standard property insurance policy, or more), and typically will carry a high deductible, an earthquake insurance policy will offer you the reassurance that you won’t lose everything when the “Big One” hits. Flood insurance, on the other hand, is very inexpensive, and every property owner should purchase a policy, even if the risk looks minimal. The fact is that every property is located in some kind of a flood zone — it is just a question of whether it is a in a moderate-to-low zone or high risk zone. About 25% of all flood insurance claims are from moderate-to-low risk areas. Many property owners believe that in the event of an earthquake or flood, the government will step in and provide disaster assistance. This is true, but only if the President declares a disaster, and even so, Federal disaster assistance is usually a loan that must be paid back with interest. For a $50,000 loan at 4% interest, the monthly payment would be around $240 a month ($2,880 per year) for 30 years, in addition to the mortgage loan that is still owed on the damaged property. Insurance can be purchased quite easily, and it’s the best way to protect the time, energy, and money that you’ve invested in your property.